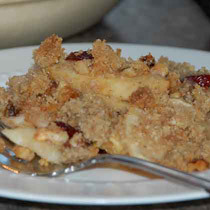 Serve this apple crumble warm from the oven topped with frozen vanilla yogurt or ice cream. Preheat oven to 350°F. Spray 9-inch pie plate or baking dish with Baker?s Joy non-stick spray with flour; set aside. Toss apples and cranberries with ¼ cup Cream of Wheat. Arrange in prepared dish. Cut 1 tablespoon butter into small pieces and arrange over apples. In medium bowl, cut remaining butter into remaining Cream of Wheat until mixture resembles coarse crumbs. Stir in walnuts.